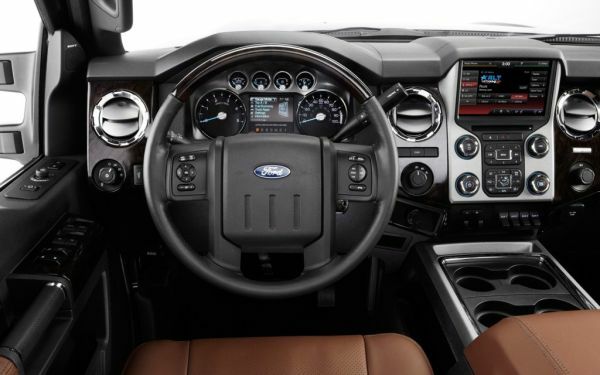 2015 Ford Super Duty is a heavy duty pick-up that claims to be the best in its class. It competes with Chevrolet Silverado 2500 HD, GMC Sierra 2500 HD and Ram 2500. Super Duty is available in 3 trims – regular, super cab and crew cab. The base model of Super Duty has a wheelbase of 137 inches with overall length of 227.6 inches, height of 76.6-79.2 inches and width of 79.9 inches. Its curb weight is 6000-8150 lb.-ft. The cargo box has volume of 77.3 cubic feet. The design is well-proportioned with the hood looking strong and reliable. The Ford logo in the front gives a distinct identity to it. The interior offers 40.7 inches of headroom, 68.0 inches of shoulder room and maximum legroom of 43.3 inches in the front. It can accommodate 6 passengers. The seats are comfortable and numerous features have been provided for making driving easy and convenient. The 4.2 inches LCD screen is driver-configurable that shows fuel economy figures, towing and off-road information and many more. Other attractive and useful aspects include competent mobile office, under seat locking storage where you can put your laptop, important documents and other valuables. Most interesting is the 110 volt/150-watt power invertor. It is stationed just at the back of the center console and is a conventional AC charger. Voice-activated SYNC offers hands-free calling, Bluetooth connectivity, USB audio facility and intuitive touch-screen controls. Two engines are offered with Super Duty. The standard is SOHC 6.2 liter 2-valve V-8 gas engine that raises 385 hp @ 5500 rpm and a torque of 405 lb.-ft. @ 4500 rpm. It can tow at the most 12,500 lbs. For heavier demands, there is OHV 32-valve 6.7 liter Power Stroke V8 Turbo Diesel that generates 440 hp @ 2800 rpm and a torque of 860 hp @ 1600 rpm. It can tow up to 14,000 lbs. Both engines are mated with a Ford 6-speed TorqShift SelectShift automatic transmission. Acceleration from 0-60 mph is achieved in 7.6-8.0 seconds while top speed is 95 mph. Mileage for Super Duty is not yet available. Its cost ranges from $31,235-$69,250. It is expected to arrive in the US markets in late 2015. Super Duty is strongly built pick-up that is meant to do heavy demanding work. It is offered with two choices of engines each of which boasts high performance and fuel economy. 2015 Ford Super Duty will be available in the later part of 2015 in the US markets.